Marion Scrimshaw - Edmonton's Burial & Cremation Professionals | Trinity Funeral Home Ltd.
Marion passed away peacefully at Miller Crossing Care Centre on February 10, 2019. Born in Wakaw, SK., she was raised on a farm and the eldest of nine children. 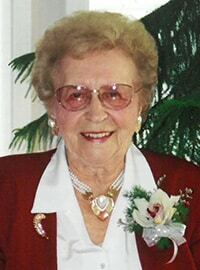 She spent most of her life in Prince Albert and Big River, SK., before moving to Alberta in the early 2000’s. Marion was self-educated and had a great talent for cooking, baking and crafts. She was devoted to her family and friends – short visits easily turned into long meals where she would joyously and lovingly cook and bake, taking pleasure in watching everyone fill up on her fine cooking. She loved to be social, right up to her final days and was always ready for a sing-a-long, bingo, spelling bee, crafts, social teas and watching and interacting with the youth groups who would visit. Marion leaves behind to mourn her sisters Chris and Pat, her brother Dave, many nieces and nephews, daughter-in-law, Joanne Sidor, Scrimshaw family stepchildren Sharon (Ken), Janet, Glen (Zorka) and Lynn (Kim), grandchildren Jessie, Gabriel, Glenda, Kevin, Cory, Levi, Tracy, Terry, Scott, Lance (Tara), Kimberly and Randy (Cheryle), great-grandchildren Ashton, Taylor, Brett, and Meagan. She was predeceased by her husband Charles Scrimshaw, sons Terry and Edward (Donna), grandson Trent and great-grandson Garret, parents Alice and John Pecarski, brothers Matt, John, George, Miro, her sister Pearl, and her first husband Fred Sidor. Our family would like to thank all of the staff at Miller Crossing for their compassion, care and support to Marion over the last five years, right up to her final days. Cremation has taken place and there will be an interment in early summer in Big River SK, where Marion will be placed alongside Charles. Exact dates to follow at a later time. In lieu of flowers, please make a donation to the charity of you choice in Marion’s name.